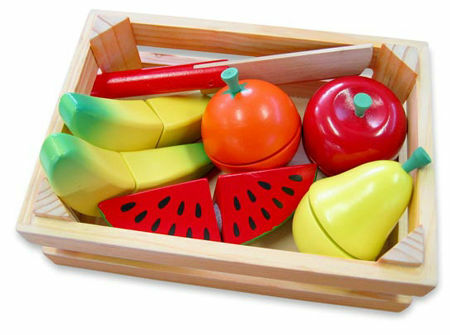 Wooden Velcro Fruit in Crate is a yummy, brightly coloured collection of five different fruits. This set comes in a solid wooden crate and contains a plum, orange, watermelon, 2x bananas, pear and knife for that all important preparation. Each piece of fruit is in 2 parts and held together with Velcro, so it can be pulled apart or cut with the wooden knife and stuck back together again. A really nicely made solid toy that is great for dinner parties or playing shop. Material: Wood, Velcro, Child-safe paint. We like this because: "We really like the sound the velcro makes when you cut it."